When you work with us, you’re in good company – we’ve been supporting the IT departments of many renowned international companies for years. … as made for each other! fme supports companies from different industry sectors with taylor made software applications. Take advantage of our industry expertise especially in industrial manufacturing and life science industry. Our consultants are familiar with industry-specific challenges and possess in-depth skills and knowledge, which of course we incorporate to your benefit into the specific solutions we provide to you. BASF SE‘s Sales and Contracting units are responsible for handling internal and external sales of technical equipment and engineering services. The customer enquiries, quotations, internal calculations, contracts and numerous correspondences that have been created have mostly been filed in paper form so far. Working together on these documents was cumbersome. The aim of the units was to replace the existing sales and contracting processes with paperless procedures and to simplify management of sales transactions. In order to meet the requirements of the ISO certification in quality management, the Bayer AG Group Information Management division describe their hierarchically organised processes in a document management system (DMS). The information, standards and regulations that are filed there are made available to the employees on the intranet. In a pilot version of the system, the loss of performance resulting from the constant, direct access to the DMS could be observed and was to be eliminated. All descriptions, texts, documents and control elements existed only in German. For the internationally operating Bayer AG, it is, however, indispensable to have them available in other languages as well. The essential change was the uncoupling of the website logic and the depicted content by using the Documentum products WebPublisher and WebCache. Now it is possible to separately depict and check different levels of the further development of the system before the changes are published for all employees on the intranet. With the redesign of the process data and its filing in XML files, a simplification of the handling and an improvement of the changeability was achieved. The archiving of the new system, which allows for different languages, at a to be determined time can be carried out either as a copy of the entire website or by creating so-called editions within the DMS. In this way, what was once available to the employees can be precisely reproduced. In the pharmaceutical industry, modifications in operational procedure, business area changes or simply the integration of a new corporate acquisition often lead to massive adaptation costs. In order to simplify matters, many companies therefore move from highly customized Document Management Systems (DMS) to standardized systems like FirstDoc from CSC. This often implies a content migration of extremely large data volumes with complex structures and an extensive version history. A successful project of this kind at Boehringer Ingelheim demonstrates how this can be done with migration-center from fme. This very large document collection, originating from different company departments globally, had to be transferred safely and accurately to the new system, under full observance of all regulatory requirements and with an audit trail of the migration. The migration had to take into account specific and historically grown structures of different business areas, successfully map existing document attributes to the new FirstDoc requirements and refl ect the needs of improved business processes. During the migration project’s 6 month migration duration, the old system would have to continue to be fully operational. All documents, including those created or modified during that interval, had to be available on day one of the new system. The special migration-center technique for a final disruptionfree changeover to the new system is based on the idea of progressive delta migrations while the old system continues to run fully operational. This means, while major portions of the data are successively migrated into the new systems, the users continue to work with the old system undisturbed and just as before. Annual Product Quality Reviews (APQRs) stipulated by approval authorities are obligatory for pharmaceutical and medical technology companies. The effort involved is considerable and they must be completed within a tight timeframe. Several company departments are burdened by manual, error-prone research. The Manufacturing Intelligence approach used by pharmaceutical company CSL Behring shows that there is another way. »We work with a wide range of IT systems in the GMP department. QlikView really stands out from the other applications. It’s simple and intuitive to process even complex research,« says Helmut Rector, Quality Assurance Manager eSystems at CSL Behring. CSL Behring has an extensive, diverse range of products for the treatment of coagulation disorders, immune deciencies, tissue repair, and for use in intensive care situations. The company must create 29 different APQRs of up to 500 pages every year. As part of the research process, data from various different source systems in different departments is compiled, output, formatted, and presented in a uniform layout. The variety of processes, products, and areas means that in parts there are only a few similarities. »We have to create APQRs for every product once a year. We are under tremendous pressure to complete time-consuming research across several company departments. The employees involved are always challenged anew to take account of the special features of the product in question. This is another potential source of error that we have to eliminate using additional test methods. All in all, the effort involved is very high,« says Helmut Rector, Quality Assurance Manager eSystems at CSL Behring, describing the requirements. – developed a new solution. »The innovative Manufacturing Intelligence solution enables cross-department big data analyses while avoiding the need to implement costly data warehouse concepts. We are transferring the analytical function away from the IT ofce and putting it back to the individual departments,« says Dirk Bode, CEO of fme AG. Global control of content with seamless information sharing is an important key factor for innovative and international operating Life Sciences Companies. Therefore, the global Life Science Company CSL Behring decided to introduce the OpenText Life Sciences Solution Suite with its business area-specific modules, which ensures consistent access, compliance and security while improving business productivity and efficiency. Manufacturers of pharmaceuticals are legally obligated to report any side effects that occur directly and in due time to the relevant European authorities and, as part of clinical studies, to ethics commissions, participating doctors and institutes and to provide evidence of this via a notice of receipt. The Drug Safety/Risk Management area is responsible for handling such occurrences. Since this kind of report on side effects often needs to be sent to a large number of recipients, fax is usually chosen as the method in order to meet the tight deadlines of a few calendar days. In the worst case, breaching this deadline may mean that market approval for the medicine concerned is withdrawn. This would mean huge financial losses for the manufacturer. The solution used up until now at Daiichi Sankyo based on a serial letter function of a word processing program led to significantly longer sending times. There was therefore an urgent need for improvement. fme AG was able to provide Daiichi Sankyo with a solution which achieves the set objectives using fax software, hardware and support through a document management system. Documents on side effects which occur will be created and managed by employees in Risk Management in the document management system (DMS). Recipient lists, attached documents and the fax template for the cover sheet will be stored and controlled centrally right from the beginning. Before actually sending faxes, sample faxes will be automatically generated as a means of quality control. Customisation of the letter and the management and control of the dispatch of faxes takes place automatically in the DMS. The current dispatch status can be followed by the responsible employee at any time. stated goal of Daiichi Sankyo Europe is to carefully design and document important business processes. The European headquarter in Munich took the SAP implementation as an opportunity to transform the approval process of mandatory validation documentation of the »System Development Life Cycles« (SDLC) from a mainly paper-based and time-consuming activity to one managed electronically. Thanks to the fme AG designed document management solution Daiichi Sankyo Europe has now been able to improve the average throughput speed by an impressive five to one ratio. At Daiichi Sankyo Europe, so-called GxP-relevant documentation of development projects, such as user requirement specifications or risk analyses, were created and processed electronically to start with, but then printed and provided with a cover sheet to be manually signed and approved in a time consuming process by every required person, starting from the person in charge of documentation up to the system owner. This voluminous documentation, sometimes composed of thousands of pages, was then fi led in fi ling cabinets of the respective system owners. The main goal of the project was therefore to shorten and simplify the approval process and frequent document searches by replacing the old paper archive, while at the same time facilitating the work of the validation agents. Important issues were central accessibility as well as location-independent approval through electronic signature, all in observance of legal regulations. Dr. R. Pfleger GmbH has been using a document management system (DMS) since 2005 to support various business processes. Subsequent expansions of the area of application proved to be problematic and cost-intensive. The low level of market penetration of the previous vendor also had a negative effect on the cost of the system and created an unwanted dependency. The old system had to be replaced by a new DMS that would fulfill the original criteria but be more flexible to adapt and guarantee a greater degree of independence from suppliers through a larger market presence. In the course of an eDiscovery project an international pharmaceutical company was facing the challenge to have to provide important documents, which had previously been managed in eRooms, in a file system to comply with rules and regulations in case of an audit. The corporate IT subsidiary was assigned to find a solution to migrate the documents reliably, according to legal requirements and enriched with additional information (attributes) from eRoom to thefile system. For a large life science corporation, fme was able to optimize the auditability, the process efficiency and the performance of its email archiving, and this for all worldwide locations. An intuitive, browser based and multilingual solution was developed for the archiving of all business relevant emails within a central document management system. Emails, or even complete mail folders, are simply dragged per Drag & Drop from MS Outlook to a specific area on the WebTop, the so-called mail drop zone. This causes initially only the pertinent metadata attributes to be transferred, allowing distinct identification of the email at a later stage. The actual archiving, including attachments, is then carried out via a dedicated server, thus minimizing the data exchange volume between distant work stations and the central server infrastructure. This way the application remains largely unaffected by bandwidth problems as they may occur between Europe based servers (MS Exchange, EMC² Documentum,archive server) and the many users located around the world, for example in Asia. Even in the computer age, invoice processing is still paper-based in a good many companies. The reason for this is the current legal position, which still requires hand-signed invoices – the only exception being invoices with a qualified electronic signature. Conversion to an electronic invoice format has so far been possible only with a small minority of suppliers. Paper invoices therefore still define the day-to-day process in Accounting. This means that compromises have to be made in process design, errors can easily creep into manual processing, and mountains of paper have to be retained. In distributed organisations, this is further complicated by the fact that the paper invoices have to be available for processing in different locations. To meet the requirements for digital supplier invoice processing, fme AG designed and developed a solution based on the InputAccel document capture system from EMC Captiva, and the EMC Documentum document management system (DMS). To enable central administration of the systems, the server-side architecture was set up completely within the German office; the pilot locations have only the dedicated scanning workstations. Web-based access to the scanned invoices is provided by the use of the Documentum Webtop product. Central filing of the data in the DMS simplifies cooperation with the headquarters in Germany and provided even field service staff with direct access to the invoices. The process of amount-based invoice approval is managed via a workflow. This is directly followed by data transfer to the ERP system, enabling prompt posting and hence seamless handling of the digital invoices in all phases of the process. Posting is supported by the facility to open the scanned invoice in the DMS directly from the ERP system. The HR departments at the BMW Group in Germany manage the data of around 80.000 employees as well as retired employees. The personnel files comprise, for example, statements of earnings, social insurance statements and certificates of wage tax deduction, with the number of documents increasing each year. In 2001, the digital personnel file was introduced with fme and Documentum in order to reduce the administration and workload involved in the processing and archiving of documents. The task of fme, in collaboration with employees at BMW AG, was to design and implement an IT system for transferring the paper documentation for personnel files to a digital archive based on the Documentum document management system. Archiving was to be designed for different sources and include various electronic and as yet non-electronic documents. The research, displaying, sorting and printing of documents was to be possible by all authorised employees in a standardised format. Particular importance was placed on security, high system availability and rapid response times. The new electronic personnel file completely replaces the personnel folder containing all employee documents, which is familiar to every company. From the letter of application, to the employment contract, references, statements of earnings and much more, right up to the documentation on retired employees – all this information is now stored electronically in pdf format at BMW AG. Access to each individual document in the files is encrypted and is protected by a very strict authorisation System. One of the objectives of the e-business SRM (Supplier Relationship Management) programme within the BMW Group was to electronically support BMW’s technical purchasing processes. For this purpose, a purchaser workplace (EAP) was developed, which allows the purchaser to handle all processes electronically, including the approval, forwarding and storage of the documents that are important for each process. It should also be possible to exchange these documents with the internal process partners (requisitioners) or the external suppliers. Due to its complexity (including around 3.000 users in the final stage of development across all corporate divisions, integration into an existing customised software, interfaces to other systems), the project presented a major challenge. Support from the automatic workflows in the EAP and the fact that all of the documents associated with a transaction are available in electronic format at any time significantly increases the transparency of the workflows, speeds up the processing and, above all, improves the quality of the processes. Approximately 200 purchasers throughout Germany are currently working with the new system. In addition to these there are another 2.000 employees from the specialist departments triggering demand who also have limited access to the system. The Landshut factory of BMW AG receives tens of thousands of parts from suppliers every day. Each delivery is accompanied by dispatch documents, including delivery notes and waybills, which are required by law to be archived for up to 10 years. To ensure that they can be retrieved quickly in case of queries, the incoming paper documents have to be scanned, keyworded and filed in an organised manner several times a day by the staff in Central Location Logistics. A particular challenge was to transfer the existing volume of approx. 750.000 documents from the old system. To implement the scan client, it was decided to use the InputAccel document capture software from the EMC Software Group, part of Captiva. In contrast to many scanning systems, InputAccel can be almost completely tailored to the individual needs of the user. For example, fme was able to configure the form screens for keywording with very little effort. With the use of the InputAccel Documentum export function, automatic filing of the scanned documents in Documentum was also a simple matter. The basis for data transfer was the “migration-center” product developed by fme. In the course of the project, the data structure was analysed, and the data read in and imported into Documentum using the migration-center module “Autoimporter”. This incorporated metadata, access rights and directory structure to file the relevant objects in Documentum automatically. The permanent logging job enabled end-to-end monitoring and provided an audit trail of the whole Migration. A major German electronics enterprise has been managing its highly sensitive contract documents with the Documentum document management solution from EMC² for several years. However, the old system no longer met the requirements of the employees over time. Now fme AG has developed a contract management solution based on the current EMC client Documentum D2. This has successfully replaced a solution based on the EMC Webtop which has existed for many years. A preceding Proof of Concept (PoC) ensured that the configurative approach of the D2 client also meets the requirements of the specialist departments, thus providing investment security for the company. For the customer, the results of the PoC served as an important decision-making basis for the implementation of Documentum D2 with the support of fme AG. In addition to migrating the application to a new client technology, the existing data was corrected and migrated using the fme migration center. User interface for contract management in the Documentum D2 client. For the major German electronics enterprise, EMC Documentum has been the system of choice for the management of its contract documents for many years. A customized Webtop client has been used so far. However, the application has grown a lot over time, becoming very complex in several areas. For example, it was often no longer possible to find contracts in a reasonable time due to the deep folder structures and the lack of a flexible search function. The optimum implementation of changes and adaptations was often not possible with the old client, or only with increased technical effort and high costs as well as time delays. Changes required editing the source code of the client and therefore always had to be coordinated with the IT department. Since up to 1,000 users will be working with contract management at distributed sites in the medium term and the customer did not intend to change platforms as such, EMC D2 appeared to be the optimum solution for a new client. EMC developed this client with a particular emphasis on a modern, user-friendly interface. Thanks to the widget and workspace concept, each user is able to put together their own personalized views very easily – optimized for the assigned tasks. Within the Research and Development division of the customer, one department is dedicated to technology scouting, whereby various sources are examined and evaluated for future trends based on basic research. This information is collected by a central division and prepared accordingly and made available to experts of Group Research for other activities, e.g. deriving strategies. This information is currently filed from various sources (e.g., newspapers, Internet, News Tickers, studies, etc.) locally as pdf documents in the file system or on a central file server. It is then made available to the relevant employees as a link or as an e-mail attachment. With this type of forwarding and access to documents only restricted options are available for the secure filing, distribution and provision of confidential information. The source system for migration was a central filing system of Group Research in which all documents were made available. The department wanted to introduce a Document Management System (DMS) based on Documentum 5.3 for the management and particularly the secure filing and distribution of content. The DMS was to replace the existing solution of document filing over approved network drives. Based on the existing plan for introducing Documentum, fme is developing/working on a migration plan in which the attributes allocated to the documents are determined as well as the means by which they are generated. The existing document inventory was a highly structured file system. With the migration-center tool developed by fme, the existing document inventory was then scanned and fully indexed. In doing so, all the metadata to be taken from the file system (including path, file name, creation date of files) was read automatically. The efficient preparation and creation of a migration plan by fme has been carried out superbly. Using the fme migration-center, the customer was able to migrate all the documents in the file system into the DMS. MAN Energy Solutions faced the challenge of replacing their existing enterprise content management system based on EMC Documentum and transferring the documents contained therein to a new system based on OpenText. migration-center, fme’s market-leading migration product, allowed the documents to be migrated to the OpenText target system in a legally and audit-compliant manner. In December 1999, after a two-year planning and construction period, the Volkswagen Communications Department opened a company archive with the task of systematically taking over, making accessible and using the historically relevant documents on the history of Volkswagen. Therefore this facility is facing enormous quantities of analogue and also digital material that will have to be viewed, recorded and preserved on a long-term basis for future generations. The set-up of a »Digital Archive« for the recording and administration of documents that are significant for the history of Volkswagen AG could be realised within a few months by combining a document management system of the American company Documentum and a software solution especially developed for this project by fme. It is the task of the company archive team to meet the requirements of modern archive science for the administration and use of historically relevant documents at the head office of the Volkswagen Group in Wolfsburg. Through the set-up of a »Digital Archive« and the continuous expansion and recording of the document stock, the preservation of the historical archive content can be guaranteed. The digitalisation allows direct and gentle access to old, possibly already damaged, or frequently required files, plans or publications. With a clear system structure, the highest security standards were to be created that would guarantee at any time that only registered and authorized users could access the data released according to legally appointed times. The archivist must be able to assign the rights for the individual document at the time of recording, and it must be transparent at all times which user is accessing which data. Vorwerk Carpets uses the docspread sales app to ensure that sales employees all work with the same documents, which are automatically updated, on their iPads. Senior sales staff manage this uniform information system centrally, saving a lot of time and resources in the process. Field staff in the sales department at Vorwerk Carpets use iPads. Previously, sales documents were shared via email or loaded onto the iPad using a USB stick. Managing these files on mobile devices, however, did not work well. Up-to-date documents were frequently not available and had to be sent again. »Our field employees are great at sales. Their ability to organize documents or use technology can vary widely though. This is why we were looking for a solution that relieved them of part of this bureaucratic paperwork«, says Jens Irmer, Head of Internal Sales at Vorwerk Carpets. All field employees should be able to get the latest documents from one central source. Another item on the wish list included uniform document storage on mobile devices, as the previous system failed to deliver the desired results using standard apps. As a result, it was not possible for all employees to use the same version of documents. The sales solution should also have an email function to supply employees with important documents such as price lists, product descriptions, technical information, and product brochures. Additionally, information about sales campaigns and visit reports needed to be transferred quickly and reliably. Every day an average of 4.000 written invoices arrive in the post-room of the accounts payable department of Volkswagen AG Wolfsburg. In order to reduce the transit and idle times, Volkswagen decided to digitalise the existing process more. Invoices were to be scanned, indexed and digitally processed. Around eight data typists see to the quick recording of the invoice data. In the mailbox of the DMS system the 110 auditing employees can immediately call up, check and book the invoices into the integrated host system. If necessary, the invoices can easily be digitally sent to the respective departments at Volkswagen AG by means of integration into the MS Exchange mail system for a material and price check. The addressee can then accept or not accept invoices with a single click. The returned documents are automatically imported into the system and forwarded to the person in charge in the accounting department. After successful productive operation of the system for almost three years, further improvements followed in a second stage. The automatic reading of invoice content via OCR/ICR software helped reduce the efforts of manual data recording and optimize the amount of forwarded paper. A comprehensive change of a CAD application in the form of functional software modifications as well as a strongly optimized work process aimed at a working time reduction of up to 90% off. In order to achieve this added value, it was necessary to train as many users as possible in the software release and the new methodology. The difficulty was that the users were distributed across all group offices and that various suppliers belonged to this circle. 4flow’s client teams work in various functional teams and office locations around the world. As the organization grew, this made cross-functional, cross-location communication and information sharing difficult. For the management team it was becoming increasingly challenging to get to know one another, to fully leverage expertise and locate specific subject-matter experts within the company. To serve their clients in the best possible way, 4flow needed to find a new solution to coordinate its own workforce and to keep each team member constantly updated. Commissioned by ESA within the ISS project (International Space Station), Astrium Space Transportation implements and operates the “Exploitation Management Information System”, in short EMIS. Its goal is to provide ESA and the Integrated Team a common platform for accessing and using non-public information about the ISS program. The team members already work with a variety of applications (collaboration, support tools, task, time and document management) while project coordination is handled mainly via email. With the aim of facilitating innovation and improving cost efficiency and adherence to delivery dates, a portal was implemented with the assistance of fme AG, which integrates all applications, simplifies project coordination through the use of workflows and task lists and facilitates internal knowhow transfer. The resulting MOSS (Microsoft Office SharePoint Server) based portal application fully satisfies Astrium’s requirements and has proved to be very user friendly. During a prior prototyping phase it could be demonstrated that it was possible, within the EMIS network, to integrate the Microsoft Office SharePoint Server (MOSS) with EMC Documentum, the document management system employed at Astrium. A pilot project covered a prototype deployment, data preparation, the design and development of needed web parts in order to integrate the external systems such as Documentum and eRoom, and to develop further knowhow for the final implementation. During this phase a fully productive portal platform was set up within the production network to serve for an initial pilot operation. The test phase started initially with 100 users. “In future all of our staff will benefit from using a central platform”, says Heinz-Martin Behrmann, team leader at Astrium Space Transportation, “and project coordination will be facilitated through the use of workfl ows and task lists.” Accessing and storing data, access to external systems and the capability of publishing information in order to facilitate the exchange of know-how, were all implemented using the user friendly MOSS Interface. 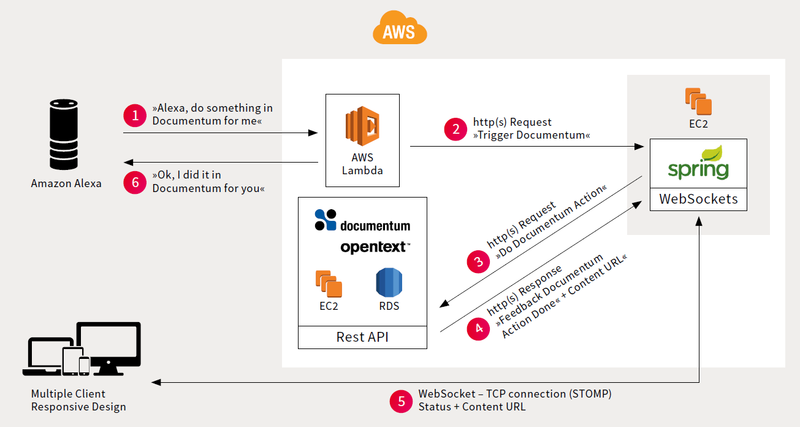 »Alexa, please open OpenText Documentum.« With simple oral commands like these, users of OpenText Documentum can now have the digital voice assistant Amazon Alexa open their documents and have her read them aloud. This is possible thanks to a showcase, which the digitalisation experts at fme used to connect a newly written Alexa skill through serverless services such as AWS Lambda and an interface with OpenText Documentum. The versatility of AWS & Amazon Alexa has enabled fme to develop a service that can be easily adapted to the specific tasks and expectations of user companies. The developers intentionally only used basic functions so that they could design the usage to be as simple as possible. In this way, users can control OpenText Documentum by voice command, navigate through it, display content, or have content read to them. »Alexa could just as easily explain simple tasks in OpenText Documentum to users. We have already thought about an interactive tutorial as well, in which Alexa could walk users through the complex ECB platform,« says Oponczewski. This would not only simplify the onboarding of new employees, but make it cheaper too. Showcase Alexa, please open OpenText Documentum! Luxembourg’s governmental departments and public administration offices decided to introduce the consistent and standardized ‘SIDOC’ ECM solution. This required all existing, highly heterogeneous and distributed databases to be combined in a single system. Among the numerous tools used for previous document migration projects, migrationcenter from fme has proven the most powerful and fl exible instrument. »migration-center enabled us to migrate even complex document structures in a clean, reliable, and transparent manner. This makes the tool truly invaluable,« concludes Jean-Claude Olivier. Over the years, the different public administration offices of Luxembourg have been implementing a great number of document management products, ranging from Documentum, SharePoint, and Lotus Notes through to file server solutions. Data processing and exchange had become very difficult due to this heterogeneous landscape, as had the administration of the associated IT systems. The consistent and standardized SIDOC ECM solution introduces a centralized and thus much more effi cient and cost-effective platform. CTIE, the nation’s official IT center, successfully rolled out the new ECM standard solution at several of the public administration offi ces. One of the key challenges was to fi nd the best way to migrate the data stored in the legacy solutions. The answer to this problem was the out-of-thebox migration-center solution. »We carefully evaluated the tools available in the market and finally chose migrationcenter, which we believe is best suited for the task at hand,« explains Jean-Claude Olivier, ECM Program Manager at CTIE. The MRSC carries out around 250 market research studies a year with international and local partner companies in 70 countries worldwide on topics such as market/market development, brand performance/development, customer satisfaction, advertising effects and product development. In addition to the reports created in the MRSC, third party studies on various topics are also purchased. In this way, a large number of documents are produced each year. In the past, these documents were managed via a Lotus Notes platform. The previous application no longer met the increasing requirements as regards authorisation concept, user administration, data quantities and searches. When creating new documents, the editor can refer back to the detailed nomenclature for the classification. The results overview provides brief information on the documents found in a search. The objective was, therefore, to develop a system which considers the various user groups with the corresponding authorisations, provides efficient search strategies and bundles information into categories according to specific topics. In addition, the range of information on the platform should be rounded off by the option of searching in external sources (InfoGate). Since the group archive is already based on technology by EMC Documentum, as part of this platform the new market research portal MafoNet+ was also created in Documentum. The documents already in the previous version of MafoNet were automatically transferred to the new system. MRSC staff now access them via an editorial system which they also use for archiving the information collected using this System. Deutsche Post set itself the objective of systematically accepting, developing and making accessible for use relevant documents on the company’s history. In so doing, vast quantities of the primarily analogue, but also digital data had to be viewed, recorded and retained for long periods of time. Due to its expertise in the area of information management, the MRSC was commissioned to design a solution which efficiently provides information and thus supports the work processes with added value. Braumschweig-based fme AG supported the Centre here as an experienced IT service provider. In collaboration with the MRSC, fme first determined which hardware capacities were to be created. After installing the appropriate hardware, the Group Archive software was adapted to requirements and implemented. In the “Digital Archive”, the individual documents are captured via a web client interface. In so doing, the documents are described using various attributes such that a detailed and extensive search option is possible later. E.ON IT GmbH needed to upgrade the repository of a Document Management System (DMS) to the most recent release level and to migrate all documents contained within the system as safely and with as little effort as possible, while at the same time extending and modernizing the existing DMS application. To best meet these goals, fme’s migration-center was chosen. For the E.ON Netz GmbH as customer, E.ON IT operates the “Digital Information and Archiving System” (DIAS), handling the archiving, editing, search and display of technical documentation. DIAS manages more than 700.000 documents inside 160.000 folders with over 2 million relations. 1.500 users access 30 different document formats such as TIFF, Excel, Word or AutoCAD, some of them quite complex, as f.e. the AutoCAD constructs of many interconnected files. DIAS still ran on the old 5.2.5. version of Documentum, no longer supported by its vendor EMC. The aim therefore was to upgrade Documentum in a single step to the latest release level. At the same time all 700.000 documents, including attributes and complex relations, had to be migrated without incurring loss of integrity or data. DIAS was functionally no longer up-to-date. In total 60 new functional requirements, such as order management and a better search function, had to be implemented. The large document volume maintained in DIAS had over time led to performance degradations. Response times for navigation and search tasks needed to be improved by at least a factor of two. E.ON Ruhrgas AG’s core business is the purchase and sale of natural gas. Both directly affected departments create and administer contracts and supplementary documents. For processing and fulfi lment of these contracts, other departments require knowledge of certain, preselected contract content in the form required by deregulation (unbundling of business areas in the energy industry). Until recently distribution was paper based, leading to considerable delays and lack of transparency. In addition, retention periods needed to be respected. This led to the project “Contract Data Management” as the implementation of an integrated, user friendly and audit proof administration and distribution of contract data on the basis of EMC Documentum and setupSmart of fme. The standardized method and consistent architecture of setupSmart facilitated the implementation of all internal enterprise WebTop applications. In order to create a central storage structure for all contract related documents based on EMC Documentum as the consistent, user friendly platform, the main focus lay in the elimination of a cumbersome, paper based distribution with all its drawbacks. Data capture, distribution and administration should henceforth be in digital form. »It was very important for us not only to optimise the transparency of document administration, but also to improve and accelerate the entire process«, says Frank Schülke, manager portal systems and DM of the Ruhrgas AG. Hess Corporation needed to migrate engineering operational documents from several file shares globally which requires retention times to be acquired per compliance. As the home-grown tool was very cumbersome, used up too much resource time and also created issues with performance on the Documentum system, Hess was looking for an alternative out of the box content migration product to effectively and efficiently migrate the file shares to their ECM system OpenText Documentum D2. Open Grid Europe has introduced a streamlined and efficient DMS for 1.800 users with the help of fme AG. Six million documents, along with all their attributes, were cleanly imported, and the document archives extensively automated and migrated without any errors using migration center. When the company was founded, Open Grid Europe required its own IT infrastructure and document management system (DMS). The existing documents from the predecessor company needed to be imported into the new DMS. Its document management system had been tailored to the needs of selected departments and expanded and customized over time. As such it was unable to meet the needs of the entire company; moreover, its structure had become relatively complicated. is easy to administrate and maintenance friendly. The new DMS needed to provide a simple, clear and straightforward structure for the 1.800 users with minimum maintenance and support requirements for future versions. To achieve this, the standard system from EMC Documentum was tailored to the needs of the company with only a few select changes. Plans also called for a new standard folder structure to be created. As the second key task, the migration of approximately six million existing documents, distributed across approximately 2.5 million folders, needed to be automated as much and as efficiently as possible. The objective for migration was to not just to carry out a straight metadata transformation, but also to unify the file structure. As part of transferring the relevant legacy documents to the new system, the out-of-the-box migration center software was successfully implemented for the migration of mass data. RWE Dea AG was looking for a software solution to transfer 165.000 documents from a local system into an EMC Documentum repository. Moreover, there was a continuous need for scanning paper documents and making them available within Documentum in the form of PDF files. Regarding the selection of a software tool for document migration, three criteria needed to be satisfi ed: file attributes for import had to be accurately defined; the document migration had to be run largely automatically; a secure verification was needed to prove that indeed all documents were being transferred free of error.